So after owning a couple of these and regretting it every time I sold one, I have no decided that this is the final cabinet. After looking around and finding nothing about it looks like I'm going to have to convert a cabinet into an Initial D, well after how many were converted to OR2 its only fair. I think if I hadn't owned a few previous and have a great fountain of knowledge living up the road (OutRun2) this would be impossible, but I do so shouldn't be hard to build though finding parts will be tricky. 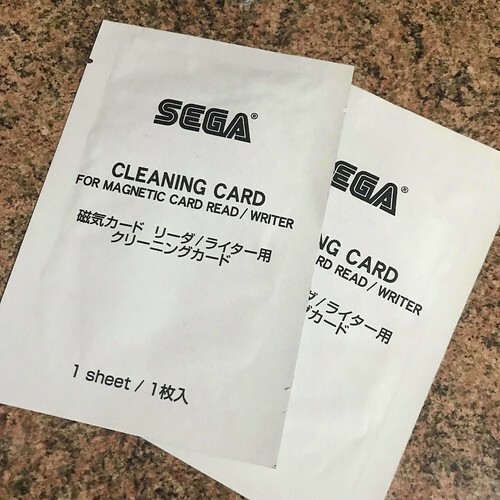 I have started a restoration blog http://www.initiald.co.uk" rel="nofollow - http://www.initiald.co.uk which will update with extra things, but add updates here. So first post... finding a cabinet shell to use as a donor cabinet. 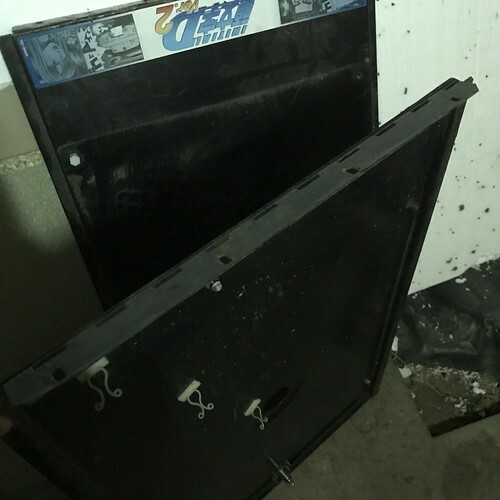 As the cabinet is going to be stripped I mainly was looking for model 3 or older cabinet, since there wasn't any Initial D cabinets around speaking with a forum member I was able to collect a Daytona 2 cabinet shell. Few features are incorrect but what I was after was the base unit. As long as it wasn't damaged it will be fit for purpose as the whole cabinet is going to be stripped, sandblasted and powder coated. So after collecting the cabinet has been stripped and all parts photographed, I have stripped the base unit and checked if its correct for purpose. It seems as though the top lid captive nuts got damaged and the previous owner drilled 4x 5mm to secure the lid :( however spoken with a few people and I can weld these holes then smooth and the sandblast/powder coating will still take to cabinet. 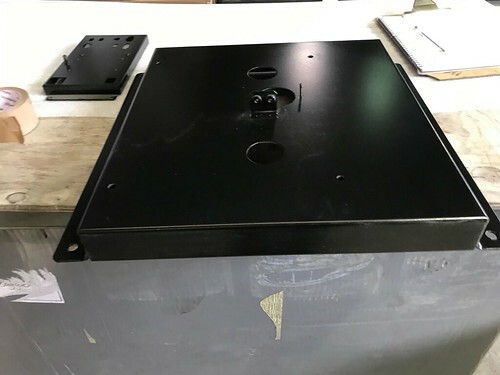 Another difference is that on the Initial D cabinets there is only a rear fan on the base, however on these Model 3 cabinets they added a fan to the rear and front of the cabinet to provide extra air circulation. This is a feature that I will be keeping as if anything it will help with the cabinet. As we speak I'm receiving quotes back in about sandblasting/powder coating, initially it was for just the base unit. However I'm also asking for prices for all parts as this maybe cost effective. So many ID cabs were killed converting into OR2 cabs, and here you are converting a cab back into ID. 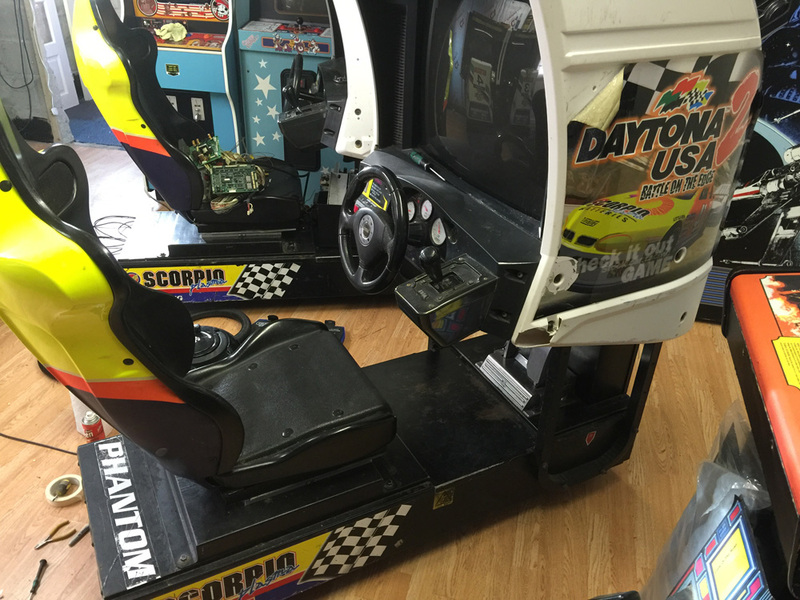 We need to start a campaign to save more ID and F355 cabs from death by Outrun 2! You are taking on quite a difficult project tbh mate, the parts shouldn't be a problem if you are patient. There is a guy who has emulated the card reader so that's an option to do away with trying to find a card reader. One thing you need to be aware of is that due to the wheel being larger on an ID cab the base lid is shorter. The cab you are converting from may have a longer base lid which will restrict opening as it will hit the wheel. 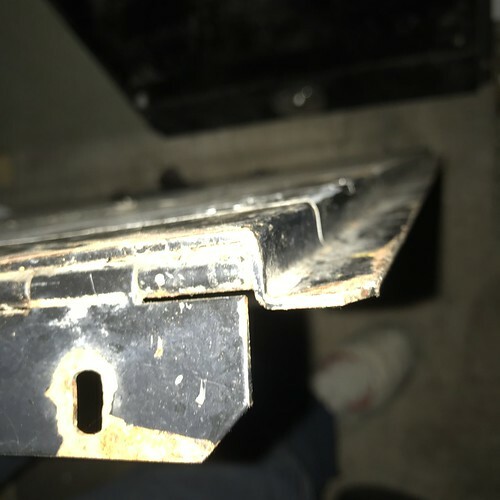 I'll be reshelling my ID jap to Jp metalwork and the last piece in the puzzle was to find a base lid from a later cab (F355 in my case) as it has a section removed on the front edge, I was pretty lucky to find that tbh. 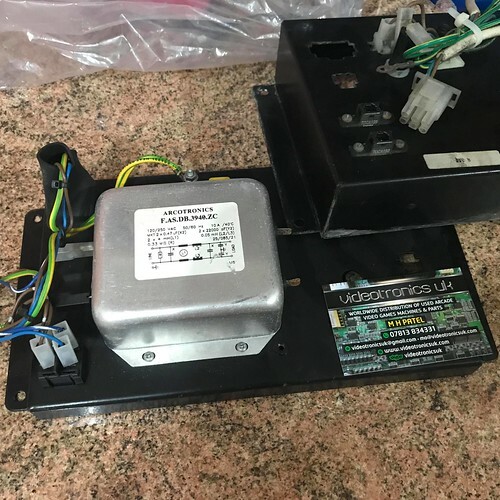 I'll be using the old shell for an ID project of my own, I have most of the parts and have a US OR2 loom as all that's needed is to splice the wiring for the card reader into it. Someone else has first refusal but if they don't want it we could probably work something out if you wanted to go that route. Anyway, good luck with the project mate. 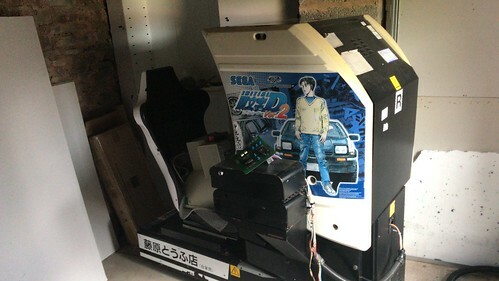 If anyone wants a proper mint Japanese Initial D3 machine PM me. My friend has one for sale. Thanks for the information... I will look into this if there is any chance someone could measure the shorter base lid for me would be great (I'm currently redrawing the whole cabinet in AutoCAD for my own purposes), creating a complete parts list and also as I have the tools (from creating Naomi Universal looms) will be creating new wiring looms and noting information on this. Basically in the future will have a full database on the cabinet and possible help someone else who is mad enough to try it again. I will be wanting to restore this with the original card reader (another part to find), but hopefully over a lot of hunting and time I will find all the parts I need to complete the project. Thanks for the offer and if you have any spare parts please drop me an PM as I'm sure I'll need most parts. As I don't have a UK D2 cab I don't know if the lid is shorter tbh, what I do know is that on a Japanese cab they had to revise the base lid to accommodate ID's larger wheel. It may be that the UK cab didn't need modifying. The length of the UK ID lid is 78cm and from the lid to the plate the pedals are mounted on is a tad over 36cm. The cab Alpha1's mate is selling is very nice indeed. I thought long and hard about buying it myself but I had to listen to my inner voice on this occasion. My UK cab has been super reliable and I already have the Jp metalwork which will be powdercoated when I find a decent powdercoater near to me. Thanks for dimensions will check when I get home. Also it seems I'm not to far from you so once I get some quotes from powder-coating I'll pass them over. 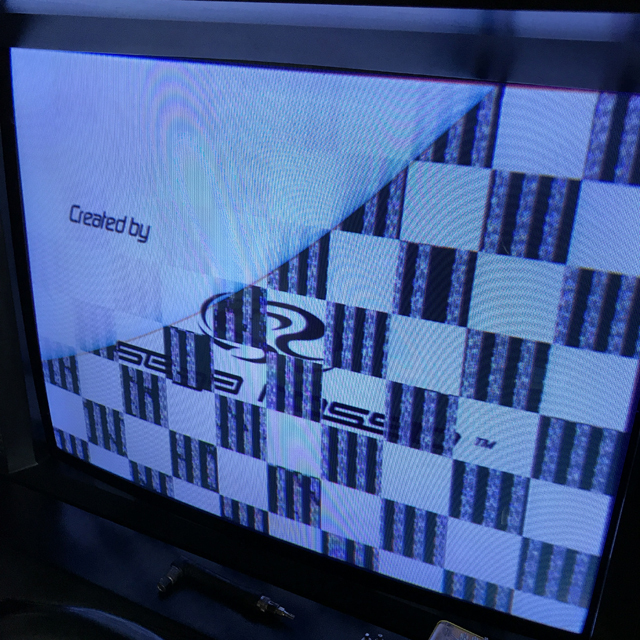 Well thanks to forum member Sean we can now continue this project as I had delivered today an Initial D 2 (slave) cabinet. Which I can now use as my model to rebuild and also restore this cabinet back to a single and play eventually 2-player!!! (or site the other at local RC Car Club). pleased you got it ok! that was very quick delivery indeed! Superb mate - I do like the iD2 livery as well - probably the least seen of the Naomi based three. Twins are great.. if you have the space!! finally got round to seeing the cabinet today and took a load of photo's. So this weekend I started to move the cabinet, I had limited time/space to move it to my house. So took the majority of the top off, also was able to stock take on what screws/bolts etc was missing. Not a major update as not an awful lot has happened (house duties)... however after some playing at the weekend and trying to diagnose a stuck button (which was stopping the start, view change, credit from working) which Im pretty certain this is a I/O board fault. With this it seemed my monitor was picking up a error, after a few conversations with Gunblade it developed into a nice GPU fault. So after hunting around for some parts we decided that cleaning and restoring the spare Initial D dashboard was a good idea. 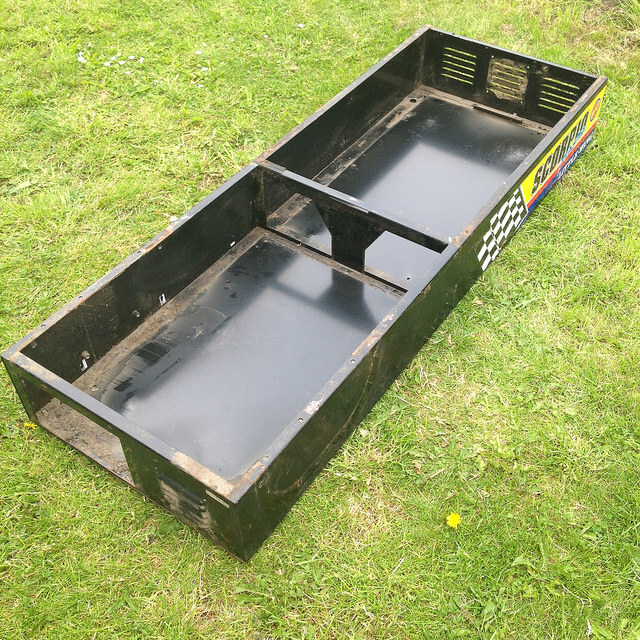 We haven't wrote a full post on website as currently we are just stripping the dash apart and logging all the parts. Due to the age of the parts we will be looking at replacing the majority of parts with NOS. wow.. ok this has been a while... so the cabinet itself hasn't moved on much. I have sourced both the left & right card reader stands, this will allow me to mount the card reader on either side without a coin tower. 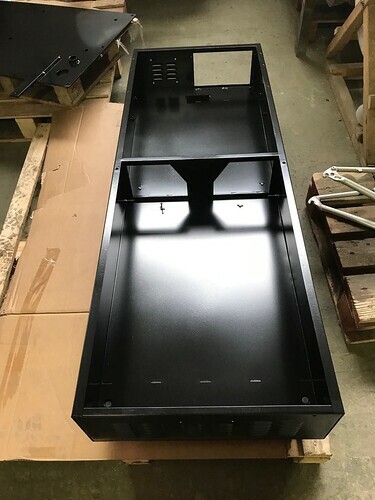 The cabinet base has also been stripped back down to a bare unit, this is going to be shot-blasted and then powder coated at the end of the month. Reason being for this is due to trying to finish off the basement for the new home of the cabinet and other games. Yes, I´m interested in to help you, I think I told you. 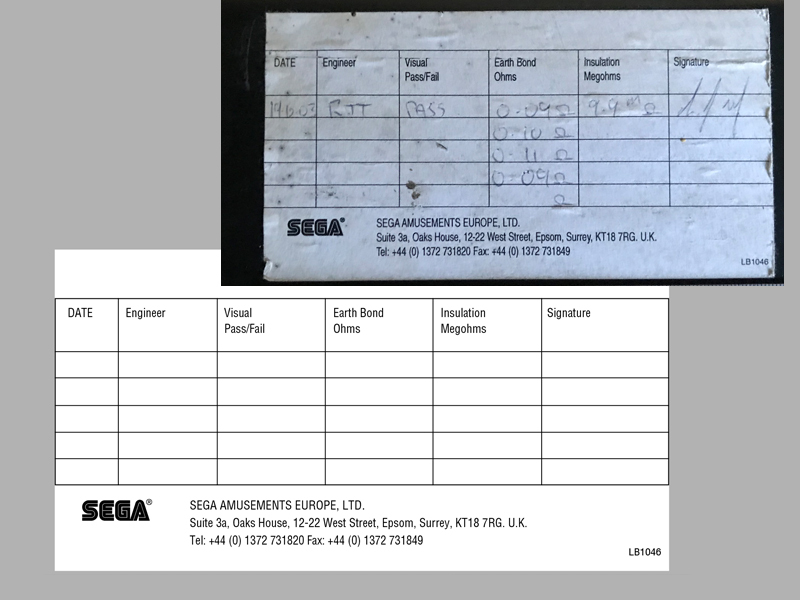 I have scanned "Initial D 1-2-3 Base decals "
I will show you more scans and restorations ahead. So as we are getting parts which are going to the shot blast/powder coating we are having to remove item and stickers etc... next on the list was the base lid. The hinge looks to been spot welded on and therefor cant be removed, which means the hinge needs to be entirely coated. 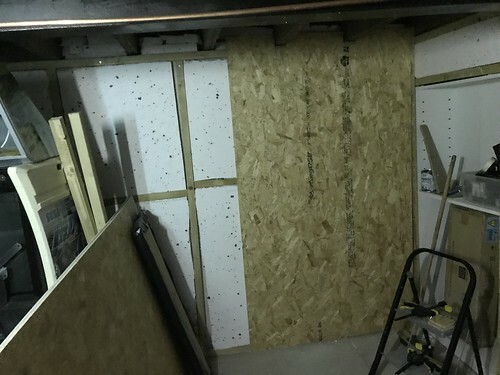 I have asked shot blast guy for advice, alternative I can drill two holes and using a pin and hammer get the pin out though would rather not drill extra holes. Some moved onto the locking part, both panels I have had been removed without the lock/key so I need to get the safety dome part off. The one lid was secured using cross head bolts, the other is using security bolts which you can see is ruined (hence why I imagine they were opened the way they were). So looks like I need to dremel a slot into the heads and then use a flat screwdriver to remove. I would love an ID cab, good luck with the rebuild. How much have you been quoted for powdercoating ? Yeah already in conversations about artwork.. just undecided on which livery to go for. 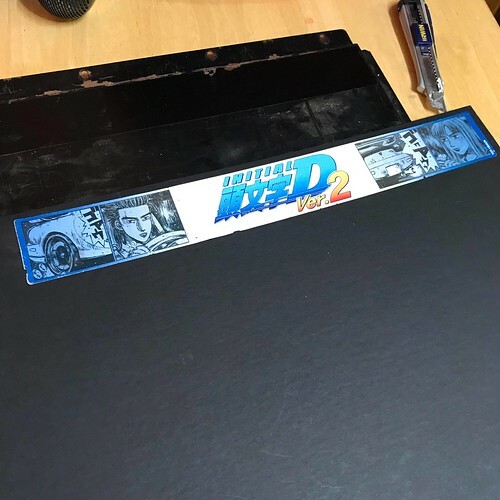 Initial D 2 UK spec only came with a twin marquee, which I do have. So its really just picking one. The intention was to get the parts done separately, however have been told that the colour can differ with batches. So now I am getting it done in bigger sections (i.e. all the base parts). In terms of price my Naomi universal base was blasted/coated last year and cost me £35. Once I get the price on my parts Ill let you know. So we picked up a travel hairdryer yesterday for the aim to remove stickers from the base so I can get them scanned or reused. So tonight we tried it with the Base Lid sticker. Little update on parts... as this was a slave machine the cabinet didnt have the full AC plate which includes a filter, AC plug or switch. Thanks to Mo @ videotronicsuk we were able to pick up the part we needed. So as I couldn't do much to the cabinet this weekend (apart from prep some bits for powder next week. I decided to try and remove a sticker. The problem is this sticker is printed on a paper label with some very strong glue. 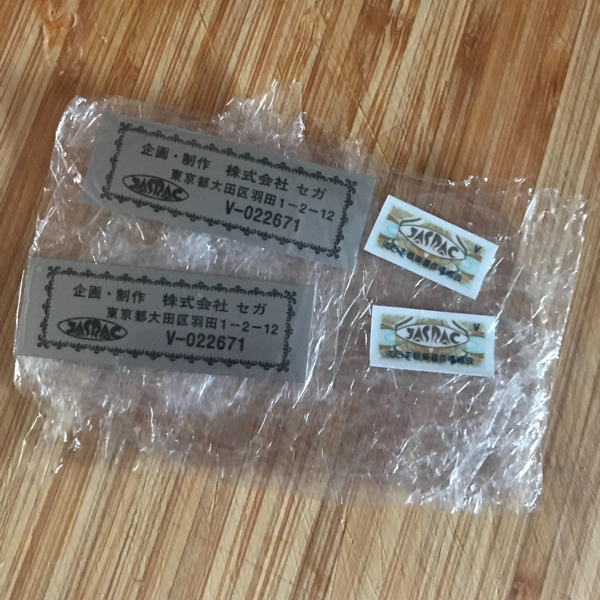 Unlike the other stickers which have a plastic feel this is very thing and stuck solid. I told some pictures and tried to remove, unfortunately the glue, age and paper won the battle and couldnt remove the sticker I have got another cabinet with this sticker on so may try a different technique on that one. Anyways from the photos I took and measurements I was able to recreate it in illustrator, this will allow a similar print to be taken. The cabinet base and few other panels went to the shotblasting/powder coating this weekend. Its not till you remove the panels and see how bad the paint was peeling from the edges... this along justifies the need to have this cabinet repainted. 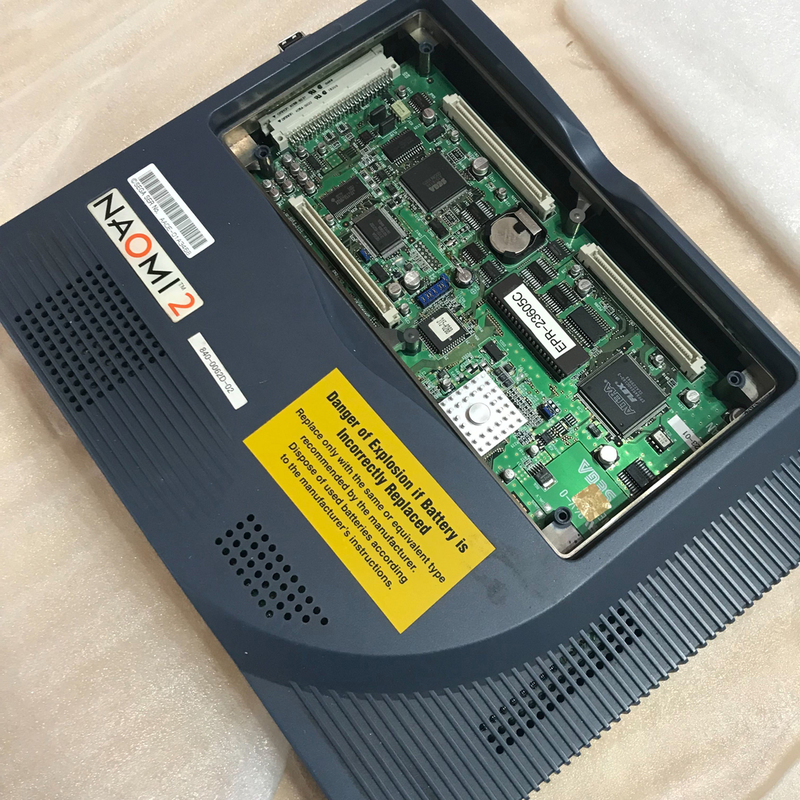 Also thanks to a forum member I was able to get a replacement Naomi2 to sort out the issues I have been having with my game/s, once this has been tested I will then order some replacement fans to help the cooling. 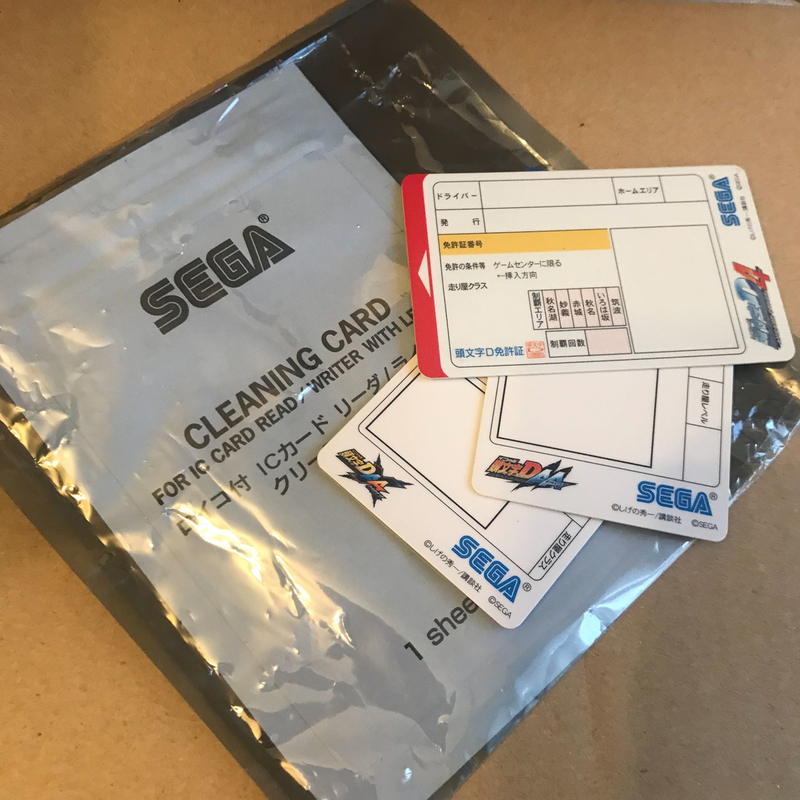 Also I got a couple of cards for the game cards collection, I think now all I need is a ID5 card and some Japanese cards from 1-3 for a complete set. So got some replacement stickers today from Mikonos11. I hope you are happy them! It is for me pleasure to restore and reproduced weird things far to normal from the usual for a fan. What are those ID4 cards? So been a while with the updates, but got these photos today from the shot-blasting/powder coating... so that's the base all ready to have new parts and stickers. More photos coming soon as the build takes shape!